Last week, the Great Plains and upper Midwest were pummeled with a late-season blizzard. A wide swath of 10 to 20+ inches of snow buried parts of Nebraska, South Dakota, North Dakota, Minnesota, and Wisconsin, with the highest totals in the 20 to 30 inch range centered in far western Minnesota, and much of South Dakota (Figure 1).¹ The storm was not technically a “bomb cyclone” because the air pressure didn’t drop 24 millibars within 24 hours, although it did get close. Figure 1.Observed snowfall from Winter Storm Wesley – NWS Twin Cities. The cyclone’s size and intensity was very impressive and the snowfall amounts recorded were stunning; in fact, they would have been substantial had the blizzard occurred even in the depths of winter. The storm system came after the “bomb cyclone,” which passed through the same area only three weeks prior, causing major flooding issues in Nebraska and nearby states. This was because the near-record cold during February caused the ground to freeze, and with snowmelt and rainfall, all of that water couldn’t seep into the ground leading to widespread flooding. This didn’t stop journalists from going into overdrive about the storm. Numerous articles, including the one below from CBS News (Figure 2), surfaced claiming that last week’s storm was “caused by climate change,” just like every single weather event “seems” to be a result of these days. Figure 2.Spring blizzard fueled by Arctic warming, climate change – CBS News. Is climate change really causing April snowstorms to occur in the Great Plains and Midwest, or is this a rare, but NOT unheard of occurrence? Let’s put this theory to the test and see if it makes any sense. “Over the past couple of decades, the Arctic has warmed much faster than of the mid-latitudes, especially in winter. Warming of the globe is being caused by heat trapping greenhouse gases produced by the burning of fossil fuels. In the Arctic this warming effect is enhanced by melting sea ice. Ice typically reflects sunlight, keeping the Arctic cool. But since 1970 Arctic sea ice volume has decreased by 50%. Right now, Arctic sea ice extent is at record low levels.”Jeff Berardelli, Spring blizzard fueled by Arctic warming, climate change (CBS News, 12 Apr. 2019). It is clearly evident that temperatures were average to slightly below average during 1970 throughout the entire year, with stronger fluctuations during the winter (Figure 3). Looking at last year’s (2018) data, it is easy to see that the wintertime temperatures were generally warmer than average, while summertime temperatures remain unchanged from where they were in 1970 (Figure 4). 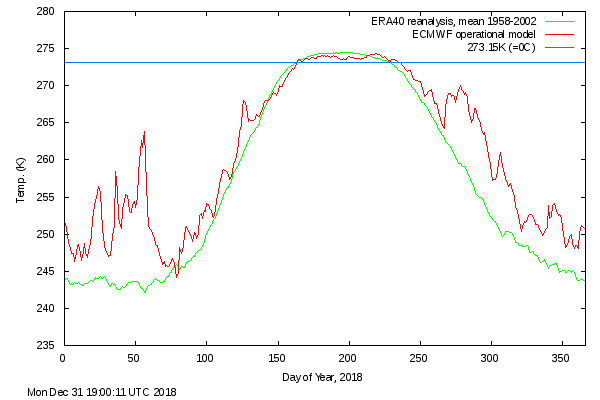 This is where the term “Arctic Amplification” comes in; a greater change in temperatures near the poles compared to the rest of the globe.³ Arctic Amplification is generally more pronounced during the winter months. The maps below from WeatherBELL Analytics shows this visually (Figure 5).⁵ When you look at the two months, – January and July 2018 – it is clearly evident that the tropics and mid-latitudes see very little change in temperatures relative to average, while the polar regions, especially the Arctic see a very large contrast from winter to summer. Figure 5. Global temperature anomaly maps (January and July 2018) – WeatherBELL Analytics. Figure 6. Sea ice cover (April 13, 2019) U.S. National Ice Center – WeatherBELL Analytics. However, the honest explanation of this requires a knowledge of meteorology and basic laws of physics. Any meteorologist or weather forecaster should understand Newton’s laws of motion. The most important of these laws for our case, is Newton’s third law, which states that for every action, there must be an equal and opposite reaction.⁸ Therefore, for every ridge (warm air) of high pressure, there must be a trough (colder air) of low pressure, which is exactly what we see in the diagram below.³ This happened because the atmosphere was trying to balance itself out, as it’s always attempting to do; and maybe it was amplified by water vapor’s warming effects, but it did not occur because of carbon dioxide. Figure 7. 2-meter temperature anomaly – April 11, 2019. Of course, the warm Gulf was “caused by climate change” too, but the fact of the matter is that a warmer Gulf just happened to be present at that time, which allowed ridging (high pressure) to develop in the southeastern United States creating a nice southerly flow of moist, warm air from the Gulf. This entire setup was ideal for this intense storm system to occur, it could have been predicted before computer modelling showed it. Figure 8. Notable Plains and upper Midwest snowstorms. – Farmer’s Almanac. The reason I go to a historical perspective on this is because late-season snowstorms of the past occurred without any climate change attribution. It’s only proper to question why storms like this are now being blamed on a trace gas in our atmosphere when all of the natural components were there to begin with. If one has a good understanding of meteorology and weather history, then they are likely going to come to the same conclusion as I did. I want to take a moment to thank Tony Heller and Joe Bastardi for keeping our weather history alive, as a lot of it would be lost without their contribution. The bottom line is this: April snowstorms in the Great Plains and Midwest; they are the rule, NOT the exception. 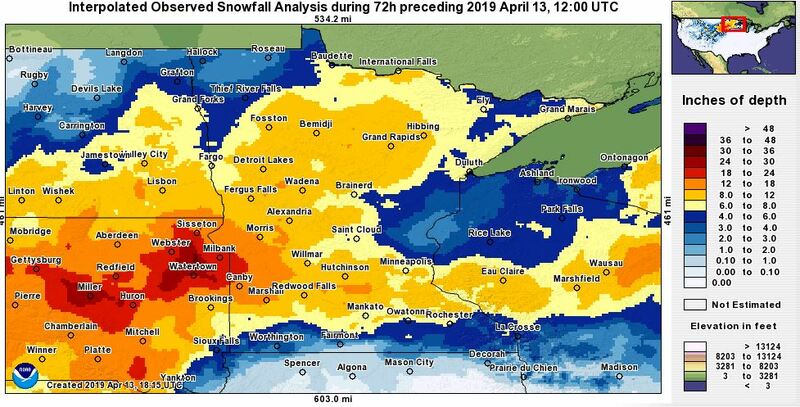 Interpolated Observed Snowfall Analysis during 72h predecing 2019 April 13, 12:00 UTC (NWS Twin Cities, 13 Apr. 2019). https://twitter.com/NWSTwinCities/status/1117154960121192450 Retrieved 14 April 2019. Winter Storm Wesley, an Early April Blizzard and Ice Storm for the Plains and Midwest (RECAP) (The Weather Channel, 8 Apr. 2019). https://weather.com/storms/winter/news/2019-04-08-winter-storm-wesley-plains-blizzard-april Retrieved 14 April, 2019. Berardelli, Joe, Spring blizzard fueled by Arctic warming, climate change (CBS News, 12 Apr. 2019). 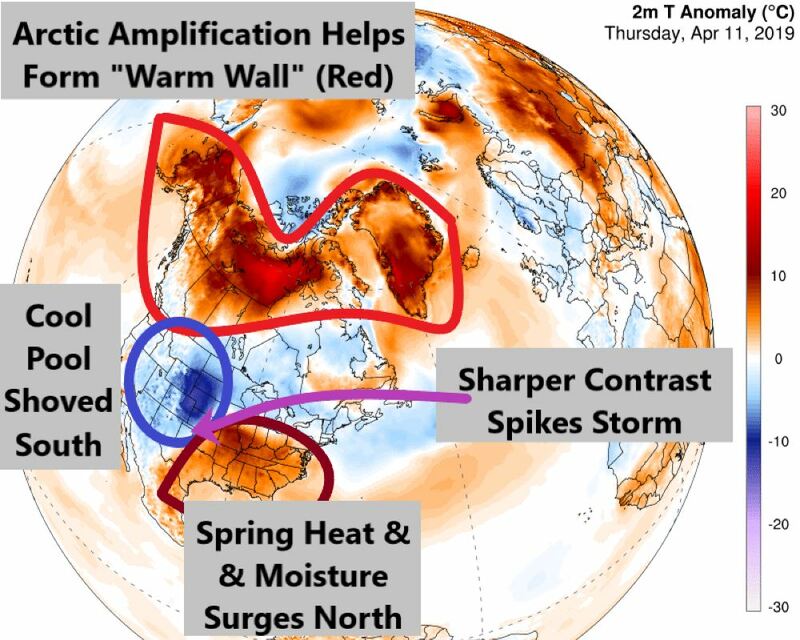 https://www.cbsnews.com/news/blockbuster-blizzard-midwest-plains-snow-linked-to-climate-change-arctic-warming/ Retrieved 14 April 2019. Daily Mean Temperatures in the Arctic 1958 – 2019 (DMI Danish Meteorological Institute). http://ocean.dmi.dk/arctic/meant80n.uk.php Retrieved 14 April 2019. 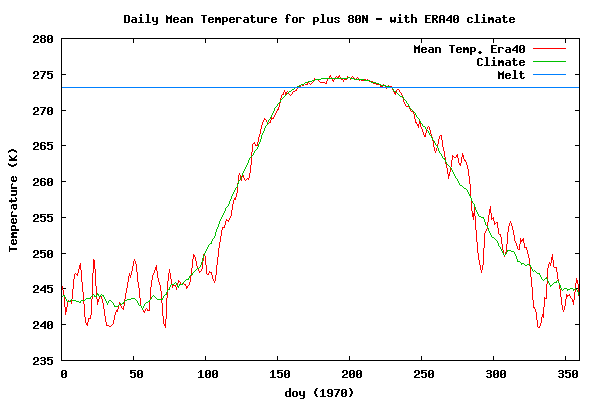 NWP Reanalysis Based Global Temperature Monitoring | WeatherBEll Analytics (WeatherBELL Models, 2015). http://models.weatherbell.com/temperature.php Retrieved 14 April 2019.
https://www.weather.gov/jetstream/atmos_intro Retrieved 14 April 2019.
https://patriotpost.us/opinion/59147-increased-water-vapor-not-co2-most-likely-reason-for-recent-warm-septembers Retrieved 14 April 2019.
http://theweatherprediction.com/habyhints2/695/ Retrieved 14 April 2019. McLeod, Jamie, Snow Kidding! Historic Spring Snowstorms (Farmer’s Almanac) https://www.farmersalmanac.com/think-snow-is-only-for-winter-think-again-3150 Retrieved 14 April 2019. ← Philly Under Water? Not so Fast.